Please check back frequently for updated stats and facts on single-vehicle accidents. More crashes involved a single-vehicle hitting a fixed object that any other type (37,668). 46% of all crashes in 2014 (55,726) involved a single-vehicle crash. 655 total deaths occured in single-vehicle crashes in Pennsylvania in 2013. More crashes involved a single-vehicle hitting a fixed object that any other type (39,479). 47% of all crashes in 2013 (57,920) involved a single-vehicle crash. 455 Deaths occured in single-vehicle accidents. 52% of lethal car accidents in PA were single-vehicle. The most common causes of single-vehicle accidents were tire blowouts and fixed-object collisions. More crashes involved a single-vehicle hitting a fixed object that any other type. 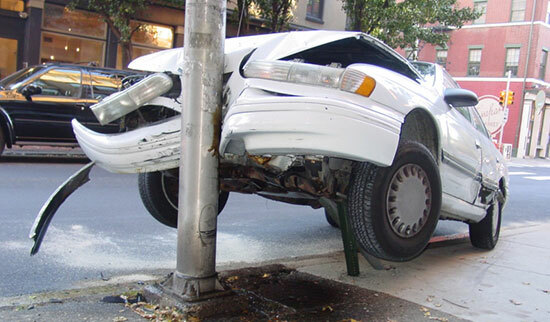 Between 2010 and 2011 crashes where a vehicle hit a fixed object in a one-car crash increased from 36,709 to 39,208. In Pennsylvania, there were 36,709 crashes where a single-vehicle hit a fixed object in a one-car crash. There were 54,819 single-vehicle crashes in Pennsylvania in 2010. Young drivers (ages 16-21) accounted for 39.5% of the single-vehicle crashes in PA - 12,436 crashes. In 2009, 61 percent of fatal crashes across the nation involved only one vehicle (18,745). Nearly 57,000 (56,894) crashes in Pennsylvania involved only one vehicle (47 percent). In 2007, 59% of fatal crashes involved only one vehicle, as compared with 33% of injury crashes and 31% of property-damage-only crashes. Among drivers ages 16-19 involved in fatal crashes in 2008, 49% were involved in single-vehicle crashes. 43% of all accidents in 2008 were single-vehicle accidents in Pennsylvania. In 2007, Pennsylvania had 42,653 one car accidents. Passenger cars accounted for 26,793 - or 62.8% - of all single-vehicle crashes. Light trucks accounted for 32.6%. The remainder of these accidents were accounted for by heavy trucks (2.2%), school buses (0.1%), and other (0.5%). In 2006, 57,684 one-vehicle crashes occurred in Pennsylvania. 25,981 - or 66% - of all single-vehicle crashes were accounted for by passenger cars. 29.2% were accounted for by light trucks. The remainder of these accidents were accounted for by heavy trucks (2.3%), motorcycles (1.9%), school buses (0.1%), and other (0.5%). 41,901 one car crashes occured in 2005. Passenger cars accounted for over 27,553 - or almost 66% - of all single-vehicle crashes. Light trucks accounted for 29.7%. The remainder of these accidents were accounted for by heavy trucks (2%), motorcycles (1.9%), school buses (0.1%), and other (0.5%).